CJ is an assembly of artists, thinkers and designers whose work aims to transform the role of jewellery in society. 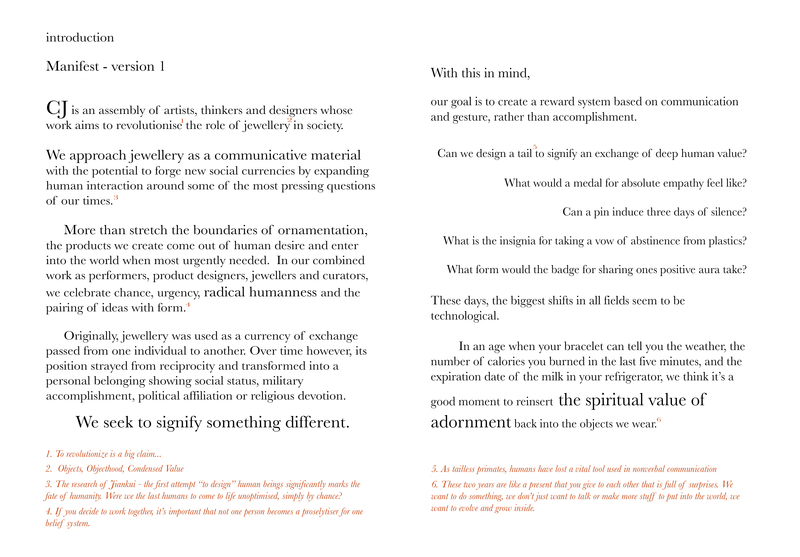 Initially formed as the Challenging Jewellery postgraduate program at the Sandberg Instituut, we approach jewellery as a communicative material with the potential to forge new social currencies by expanding human interaction around some of the most pressing questions of our times. More than stretch the boundaries of ornamentation, the products we create come out of human desire and enter into the world when most urgently needed. In our combined work as jewellers, fashion designers, performers and curators, we celebrate chance, urgency, radical humanness and the pairing of ideas with form. Originally, jewellery was used as a currency of exchange passed from one individual to another. Over time, however, its position strayed from reciprocity and transformed into a personal belonging showing social status, military accomplishment, political affiliation or religious devotion. We seek to signify something different. With this in mind, our goal for an A-i-R programme is to create a reward system based on communication and gesture, rather than accomplishment. Can we design decoration to signify the exchange of deep human value? What would a medal for absolute empathy feel like? Can a pin signify three days of silence? What is the insignia for taking a vow of abstinence from plastics? These days, the biggest shifts in all fields seem to be technological. In an age when your bracelet can tell you the weather, the number of calories you burned in the last five minutes, and the expiration date of the milk in your refrigerator, we think it’s a good moment to reinsert the spiritual value of adornment back into the objects we wear.